Yesterday, we had a Leonardo being cleaned. Today, it’s a Leonardo painting being photographed, with a mega good camera. 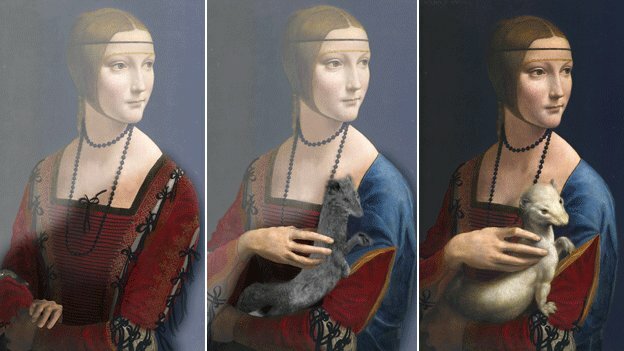 Pascal Cotte, of Paris’s Lumiere Technology, has spent 3 years subjecting Leonardo’s hugely famous portrait of Cecilia Gallerani with an Ermine to a technique called the Layer Amplification Method (LAM), and has apparently discovered that poor old Cecilia once LACKED her posh, furry companion. LAM works by firing a series of powerful lights at paintings, and a computer then registers the differences in the amounts of light that is reflected, thus revealing insights into what paintings look like beneath their uppermost layer. It is this procedure that has yielded the discovery that Leonardo’s portrait once showed Cecilia without the ermine, then showed her with a regular ermine, and then, finally, with the steroid-pumped ermine we see in the picture today. The portrait, which is dated to about 1490, shows Cecilia Gallerani, the mistress of Ludovico Sforza, the Duke of Milan and Leonardo’s chief Milanese maecenas. 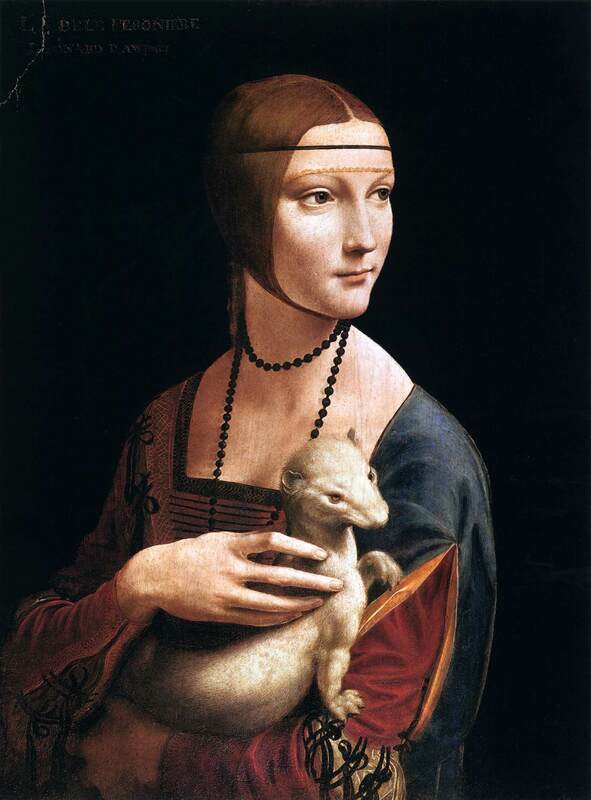 It has always been thought that the portrait was originally conceived with the ermine, as a signifier of Cecilia’s love for Ludovico, who was supposedly nicknamed “the white ermine”. That explanation still stands. 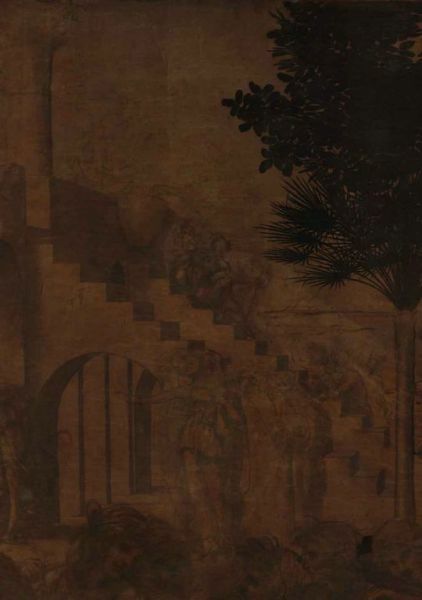 But the real significance of all this is that it sheds light on Leonardo’s practices who, clearly, continued to play around with ideas even once a painting was well underway, as well as the specific circumstances surrounding the execution of the portrait. Why did Leonardo add an ermine to what otherwise seems to have been a finished portrait of Cecilia? Perhaps Cecilia requested it herself. Or Ludovico. So he added one. Thus portrait version #2. But then the portrait underwent another change, with the ermine becoming curiously bulky and sporting lion’s paws. Thus portrait version #3, the final one. Why modify the ermine? 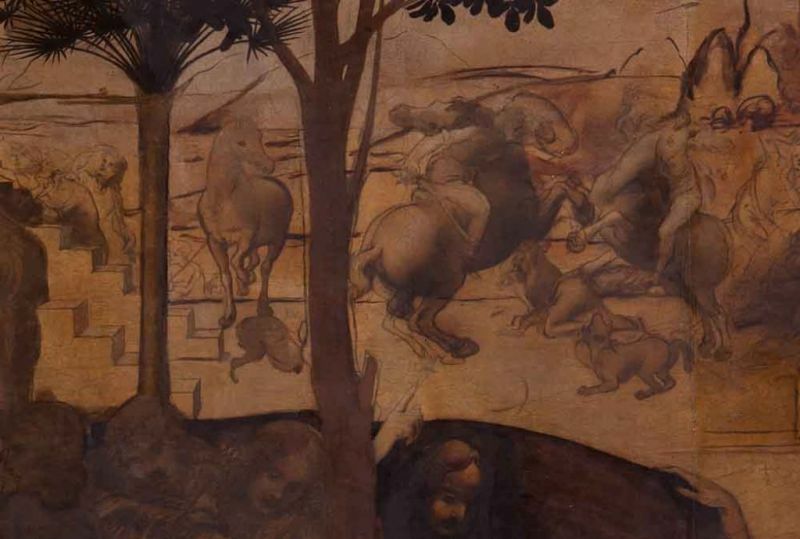 Perhaps this bit’s Leonardo’s invention, who, rather than choosing to represent Ludovico with a scrawny ermine (version #2), tried to flatter the Duke by envisioning him in the guise of a bodybuilding ermine. All interesting stuff . 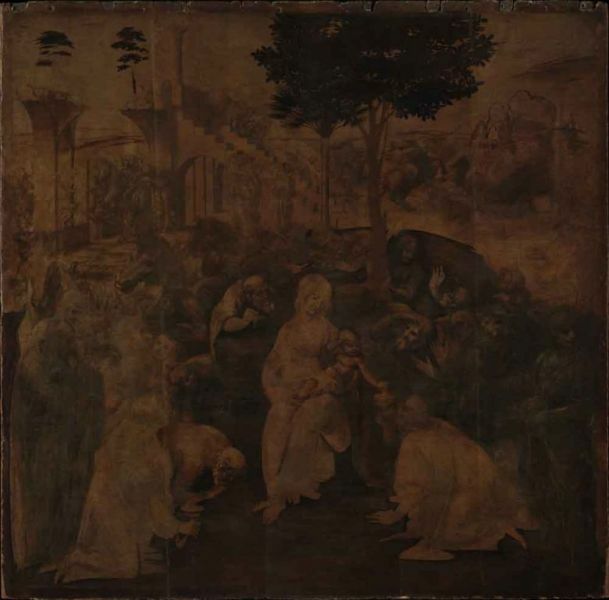 . .
As if the promise of a brilliantly restored Ghent Altarpiece wasn’t enough, then we can also now look forward to seeing Leonardo’s remarkable Adoration of the Magi of 1481 (above) looking a lot less, well, murky. 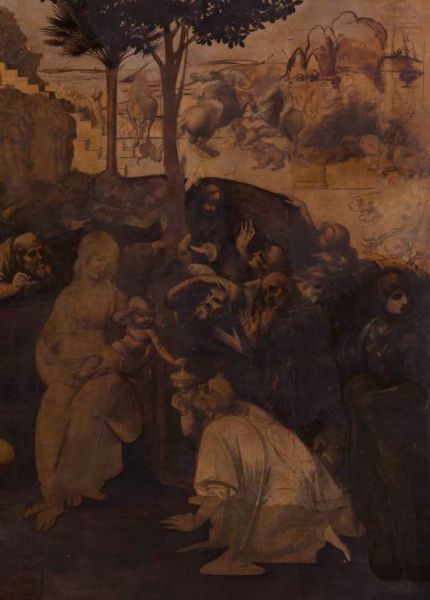 Leonardo was commissioned to produce the Adoration by monks from Florence’s San Donato a Scopeto. 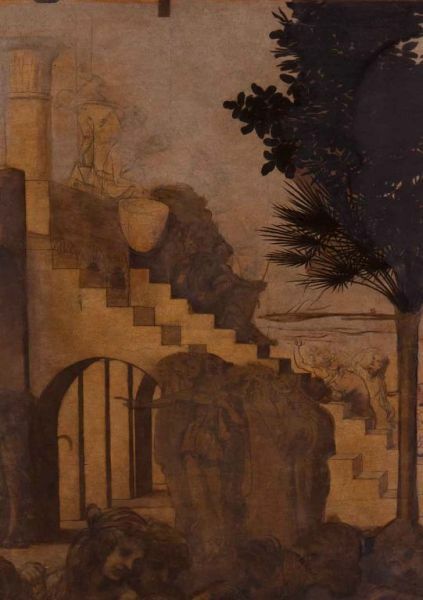 Leonardo abandoned the work, however, when he left Florence for Milan in 1481. In his stead, Filippino Lippi was asked produce an Adoration of the Magi, which he delivered in 1496. 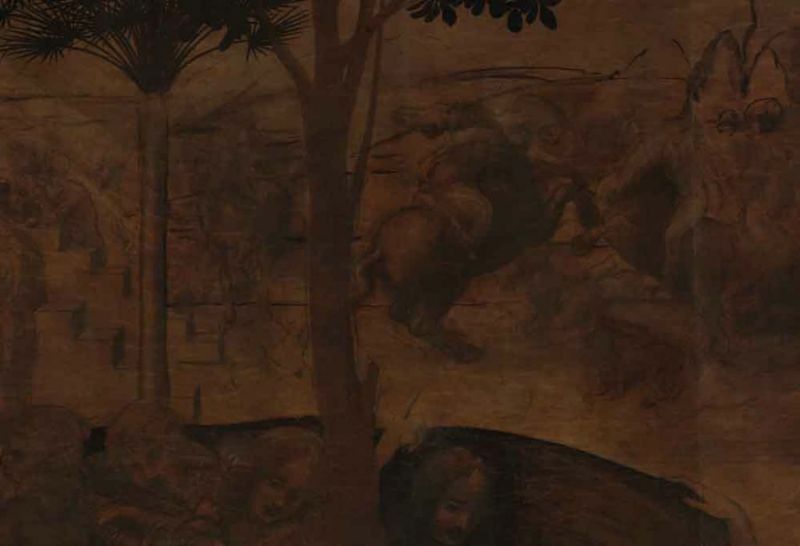 Both works–Leonardo’s incomplete and Lippi’s complete Adorations–are housed inside the Uffizi. 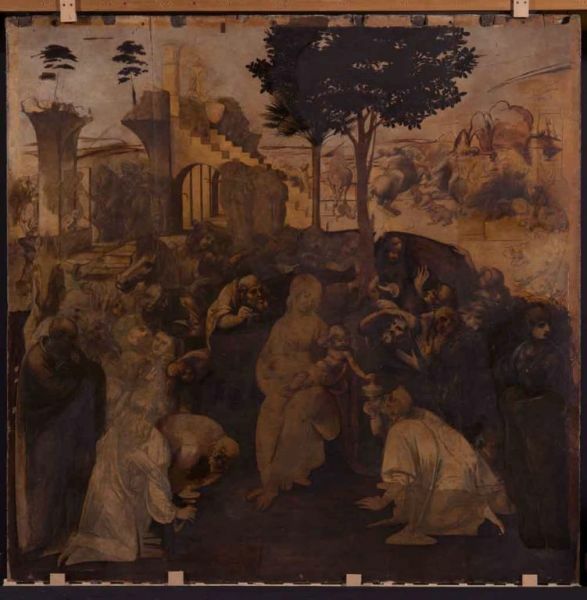 In the early 2000s, the idea was mooted that Leonardo’s unfinished painting might benefit from restorations, and these restorations are now underway, being done by Florence’s Opficio delle Pietre Dure, which is one of the foremost institutions for the conservation of pictures in all the world. Recently they put on a conference (of sorts–typically Italian in its rusticity, as you can see above!) to show some of what they’ve managed to achieve. The restorations aren’t complete, but even in its partial state, what they have achieved looks pretty damn good. I think we’d all agree that they’ve done a sterling job so far, and we can look forward to seeing the finished product. In the meantime, find out a bit more about the cleaning and see more images here. When I was procrastinating on campus during the spring term 2014, I decided to leaf through the ‘paid summer scholarship opportunities’ that had been emailed to my student account. I fell in love with one of the project outlines for an Undergraduate Researcher. 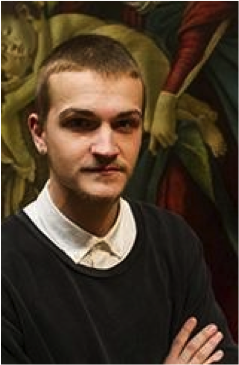 The Undergraduate Research Scholarship (UGRS) scheme gives UG students the opportunity to work as a paid research assistant for 5 weeks over the summer, under the (refreshingly relaxed) supervision of an academic. It sounded more appealing than bar work to say the least. 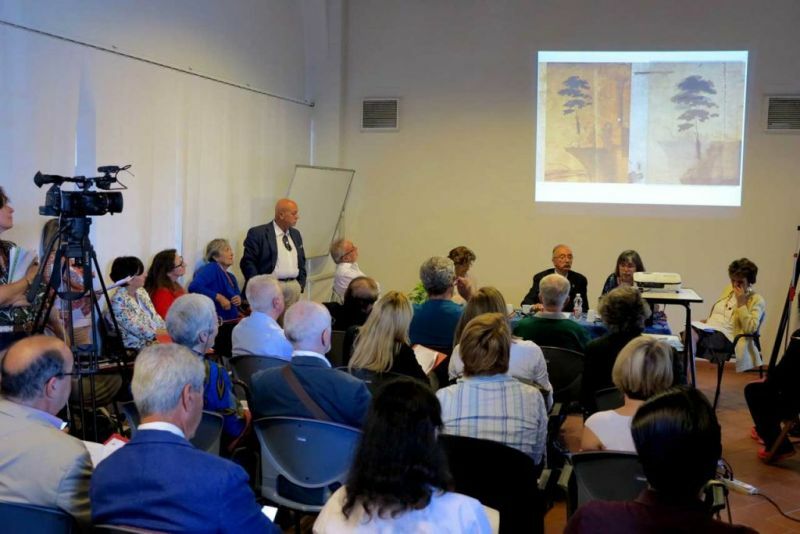 The project that caught my eye was entitled “Anne de Graville at the French Court: Her Library, her Religion and her Works” and was being run by Dr Elizabeth L’Estrange in the Department of Art History, Film and Visual Studies. Anne was an enigmatic noblewoman in the early sixteenth century, who owned a fascinating library and composed two known literary works at the behest of Queen Claude of France, wife of the more famous Francis I. One of these works was a reworking of Boccaccio’s Teseida, which was also the inspiration for Chaucer’s Knights Tale in which two knights fight for the hand of Emilia; the other was an adaptation of Alain Chartier’s Belle dame sans mercy in which a lady refused the advances of a knight. The aims of the project were enticingly broad: ‘Find out more about the books in her library’, ‘explore the culture of the French court’ and ‘study the implications of Anne’s own works’. Two hours later, I had written, re-written various application drafts, sent off the least pretentious version after seeking the advice of many friends, and embarked upon forcing the whole thing out of my mind before I could get too excited. 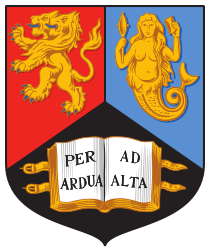 The second year of my Modern Languages degree (in French, Italian, and Spanish) had lead to me take an interest in early modern Art History, as some of my preferred modules had been Italian Studies’ classes on Dante and the Italian Renaissance, and the Hispanic Studies’ department’s module on Medieval Iberian literature and culture. I was especially intrigued by portrayals of women as muses of the Italian Renaissance, temptresses of the Middle ages and as various manifestations of the Madonna-Whore dichotomy. Upon reading the UGRS brief, I realised that I had never studied works about women, by women. Researching Anne de Graville would be an opportunity not only to investigate the roles and portrayals of women, but also to observe the cloak-and-dagger techniques of early modern women who sought to actively engage in the debate over their position in society without being dismissed as uncourtly, radical rebels. To my delight, I was offered the scholarship and couldn’t wait to get started. I frequently told my family and friends how excited I was, although there was the persistent fear of ‘Not Finding Anything’. As part of the project I would be meeting regularly with Liz to discuss my progress and findings, and I had nightmarish visions of meekly admitting to her that I had read lots, discovered nothing and had no insights to offer. From here came perhaps the best lesson I learned through the UGRS: research can’t be compared to filling in answers in an exam paper, or gathering enough information to fit the word limit on an essay. I remember Liz telling me to inform her if I came up against ‘dead ends’, and it was refreshing to realise that finding limited resources on one line of enquiry was Okay, and Not Finding Anything can still be progress. 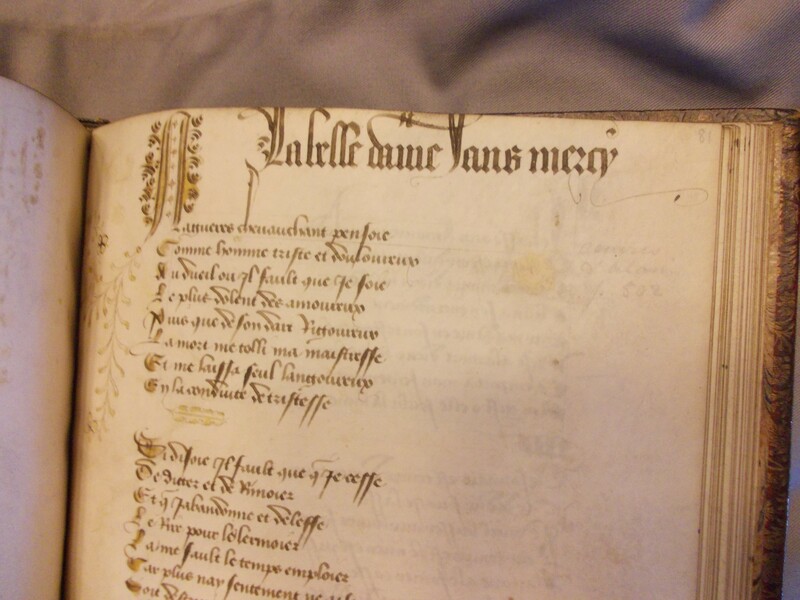 One memory of the project that stands out in my mind is the day that I visited a library in Manchester to investigate a 15th century manuscript relevant to the project. As part of my Medieval Iberian module, I had previously had the opportunity to delve into Birmingham’s own Cadbury Research Library, to pour over manuscripts from the 14th-16th century. I loved how doodles in the margins were not acts of vandalism, but invaluable insights into the reading experience of someone who had handled the works centuries before. 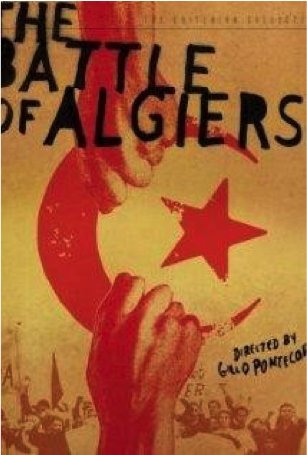 During the research project, I had become rather tired of leafing through secondary sources, and I wanted to examine original texts to see for myself what all the fuss was about. 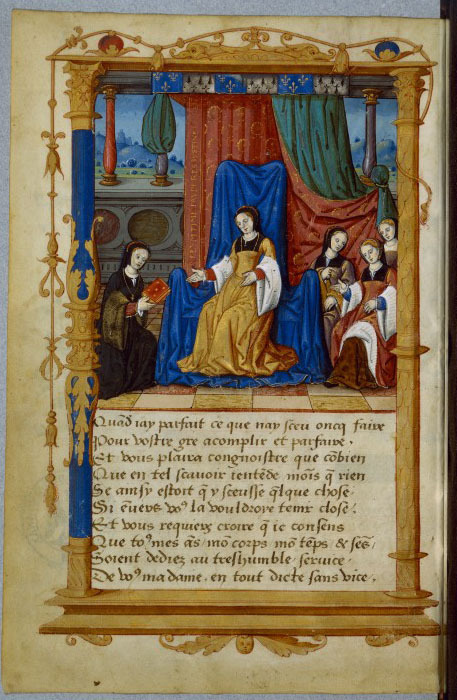 One of the main focuses of my research was Alain Chartier’s 15th century work, La Belle Dame Sans Mercy, which Anne de Graville adapted to create one of her own works, the Rondeaux. I knew all about various interpretations and analyses of this important text about courtly love, but it dawned on me that I hadn’t seen any versions of the original work. 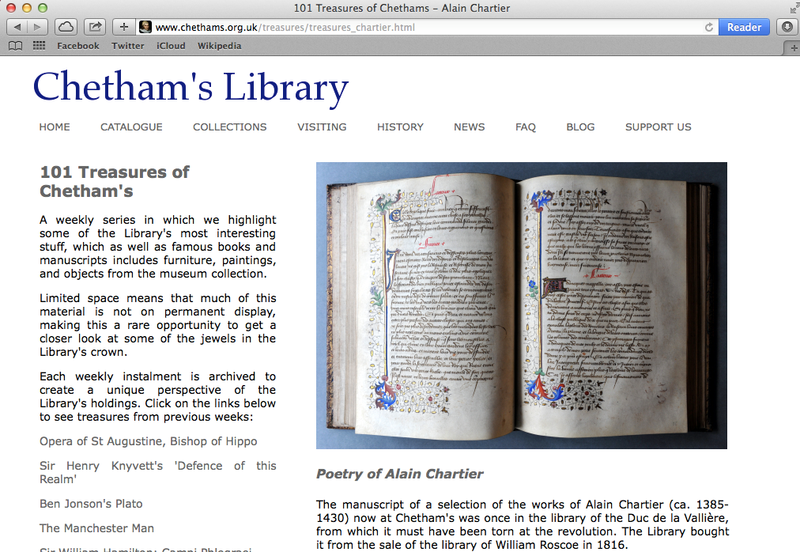 During a half-hearted Google search, I stumbled across an article on the Chetham’s Library website, featuring “The manuscript of a selection of the works of Alain Chartier (ca. 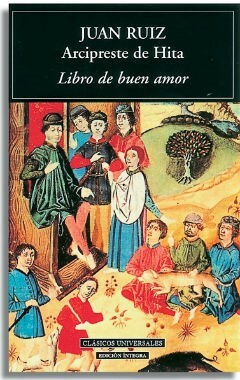 1385-1430)”. Chetham’s Library is in central Manchester, and I was staying at my parents’ house that was less than an hour away. Slightly ashamed of how excited I was, I picked up the phone to arrange a visit. I felt like a child, phoning up school pretending to be my mother, as I said I was a ‘researcher interested in investigating one of your manuscripts’. They didn’t call me out and expose me as a clumsy 19-year-old Undergrad however, and I set up an appointment to see the manuscript the next day. 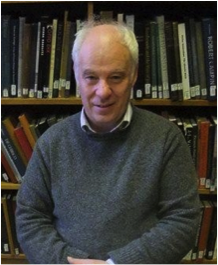 When I arrived at the library, part of me was expecting to be presented with a protective display case, thick gloves and an overbearing supervisor to protect the 15th century manuscript, even though I knew from my experience in Birmingham that I might just be able to pick it up. I was lead into a grand, wooden-panelled reading room and presented with the text that I had studied so intensely that it felt legendary. I was struck by how sturdy it was, and how vibrant the illuminations were. 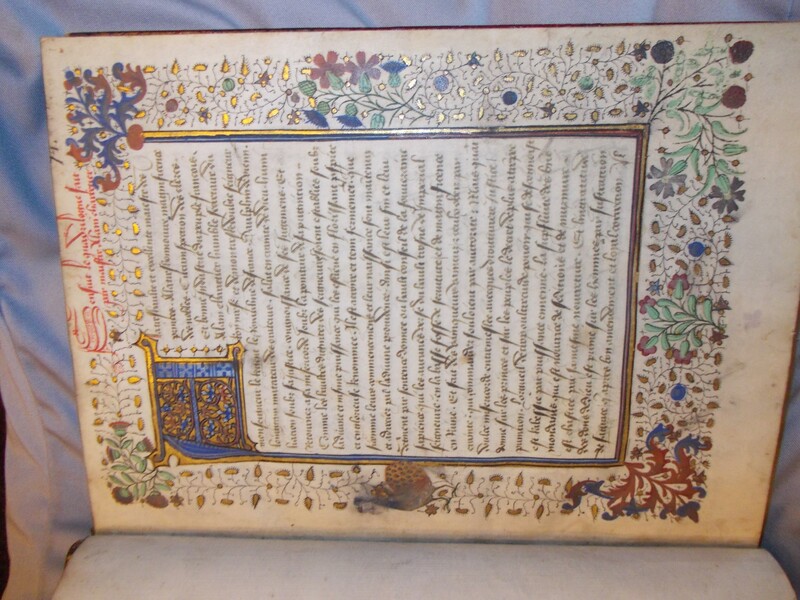 I spend the whole day gawping at its pages and delving into its history – who had it belonged to, where it had been bought, and could it possibly have passed through any circles relating to Anne de Graville’s court? At the end of the day I photographed the pages most intriguing to me, wrote up any notes I had made on its history, and bid the friendly librarians farewell. I was touched by how pleased they were to see me; they wanted me to keep in touch with any findings that came of my visit to the library, and they were interested in the research project. This ties in to the most poignant thing I have learned through the project: the value of contributing to an academic community, using each other’s materials and developing existing analyses. I had read about interactions between writers at the early modern court, in that each new text was created as part of a dialogue with previous writers and their works, and it amused me to see this replicated in the study of manuscripts as well. Each new article on La Belle Dame Sans Mercy would address the works of previous academics; just as Anne de Graville’s Rondeaux was her response to Alain Chartier’s original. The scholarship has been an invaluable experience for me, teaching me more about the research process, and how to manage my workload when I don’t have a simple question to answer or goal to reach. My growing interest in early-modern literature has been indulged, and I am becoming increasingly familiar with the study of manuscript culture. Liz’s enthusiasm and encouragement combined with my fascination with the debates that I came across in the articles I read have made the world of academia seem enticing rather than daunting, and I hope this opportunity proves to be an influential one in my future academic choices. 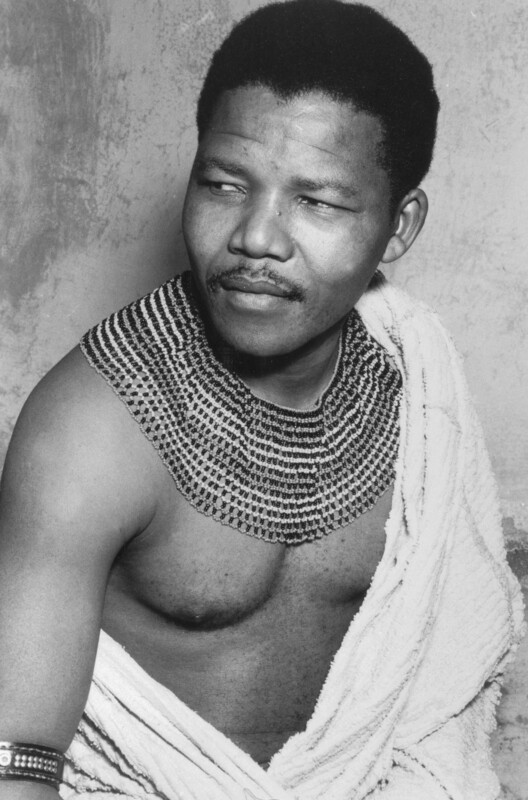 This lecture will look at the artifice and stageyness of African studio portraits via the project ‘Black Photo Album’ by Santu Mofokeng, the performed veracity of Samuel Fosso’s disguised self representations, and the ubiquity of a specific image of the young Nelson Mandela, widely regardedas ‘traditional’ and authentic. Throughout photographic portraiture is considered as a medium that mobilises the artifice of the studio, fancy dress and costume in the production of photogenic and fitting subjects. Please also note that the full schedule for the Department’s Research Seminar series will be made available soon. 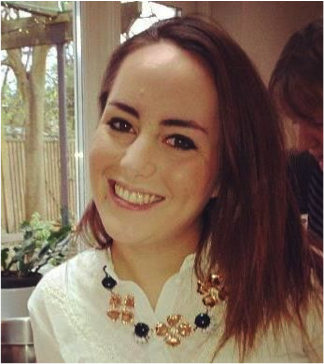 “One of the most interesting modules I studied at university was The Political Thriller on Film. 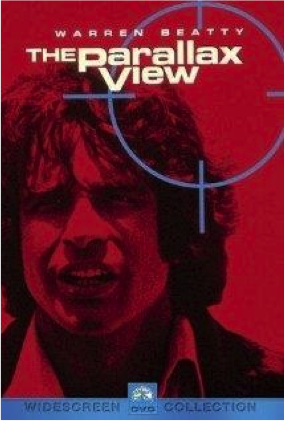 The module, which looks at the film genre of the Political Thriller, explores how film makers since the 1960s have used the genre as a vehicle to explore the ongoing challenges and controversies of a highly politicised modern world. 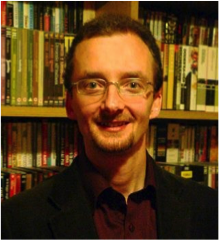 Having not previously had the chance to study film, the course has given me the opportunity to apply my visual analytical skills in a different way, alongside learning key theoretical concepts, exploring response to film and the debates raised. 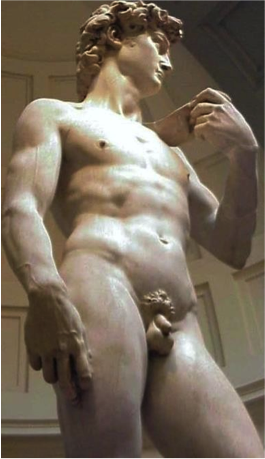 Focuses on the wide-ranging works of Michelangelo, identifying his artistic objectives, his special achievements, his influence and his reputation.